Mississippian and Tertiary bedrock (left) is mantled by Lake Bonneville gravels above Salt Lake City. The Warm Springs fault scarp, where not removed by aggregate mining, trends along the right side of the photograph towards downtown. Adam McKean joined the Utah Geological Survey (UGS) in 2010, and since 2011 has worked as a geologic mapper for the Geologic Hazards Program. 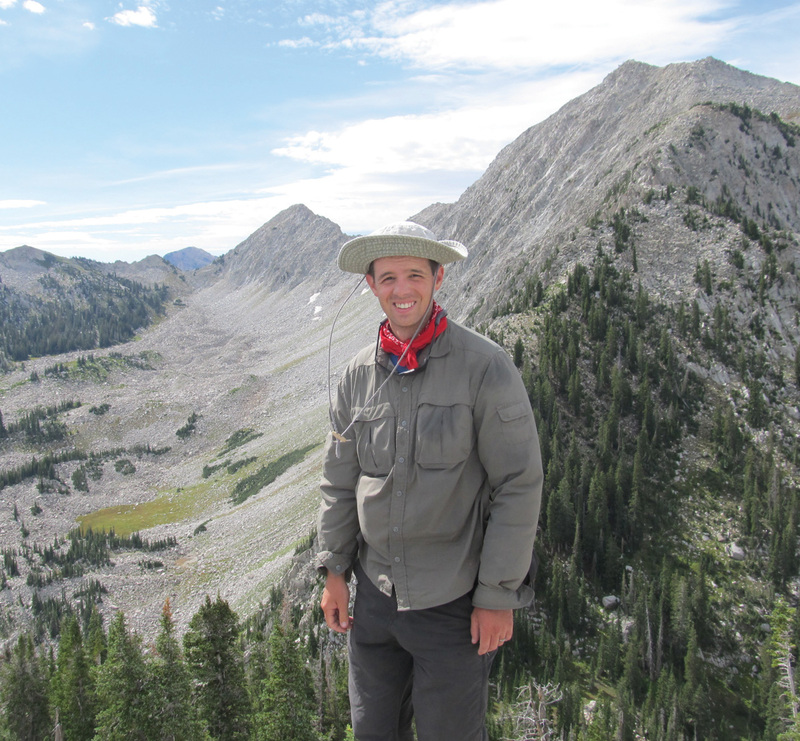 His work focuses on mapping the surficial geology of the greater Wasatch Front urban area. During his time with the UGS, Adam has mapped the geology of seven 7.5-minute quadrangles. As a part of his mapping, Adam works closely with the geologic hazards mappers to identify the geologic hazards in each quadrangle for future UGS geologic hazards map sets. He is currently mapping the geology of the Sugar House quadrangle in eastern Salt Lake Valley. Besides geologic mapping, Adam is also involved in Lake Bonneville and Great Salt Lake research, LiDAR mapping of the Wasatch fault zone, landslide emergency response and monitoring, paleoseismic trenching, geologic map and geologic data archiving, and loves to work on the bedrock geologic problems of each of his projects. Urban geologic mapping may sound like a mapper’s nightmare considering the rapid expansion of limited-access property and disturbed land and development that cover up the geology. One may ask, “Why map geology in and near a city?” The simple answer is that urban areas need surficial geologic maps to aid the land development and management process by identifying potential geologic hazard issues. These mapping projects also provide valuable information needed for further geologic, geologic hazard, groundwater, geotechnical, and engineering investigations. In my recent geologic mapping of northwestern Salt Lake Valley, including the Baileys Lake (see UGS Open-File Report 624) and Salt Lake City North 7.5-minute quadrangles, I mapped a number of geologic hazards including problem soils, flooding potential, faults, landslides, and rockfalls. While mapping between Salt Lake City and Great Salt Lake, I documented several interesting river, delta, and lake deposits associated with late Pleistocene Lake Bonneville (30,000 to 13,000 years ago), the Gilbert-episode lake (~11,600 years ago), and Holocene Great Salt Lake (since ~11,000 years ago). Following the regression of Lake Bonneville, rivers and deltas migrated across the valley floor and deposited sediment in the Gilbert-episode lake at the southern margin of the mapped area (A in mosaic image). Then after withdrawal of the Gilbert lake, the paleo-Jordan River incised into the lake deposits of the previous larger and deeper lakes (B in mosaic image). At the mouth of the west flowing paleo-Jordan River, a lobate delta developed along the Holocene Great Salt Lake margin. During the late Holocene highstand (4800 to 2100 years ago), Great Salt Lake flooded the valley to an elevation of about 4217 to 4221 feet. 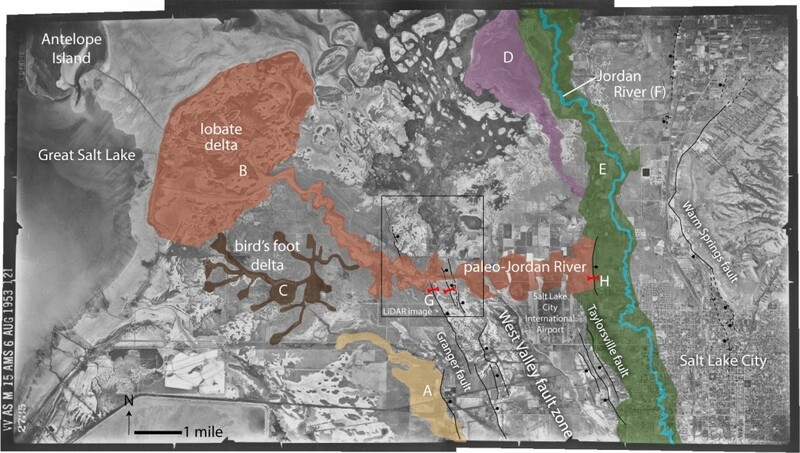 A small bird’s foot-style delta likely developed at this time to the south of the main river channel in shallow water covering the river floodplain and older lake deposits (C in mosaic image). Sometime after the late Holocene highstand, both deltas and the paleo-Jordan River channel were abandoned, and the river shifted to the north and now flows into Great Salt Lake through Farmington Bay (D, E, and F in mosaic image). This channel and delta shift may have been influenced by displacement on the Holocene-active Granger, Taylorsville, and Warm Springs faults. The sand and silt from these river, delta, and lake deposits combined with shallow groundwater around the lake make them potentially liquefiable during future earthquake ground shaking. Other mapped surficial deposits contain clay, silt, and organic matter and pose a potential for problem soil and foundation settlement hazards. The mapping of these deposits is important for identifying and mitigating geologic hazards. 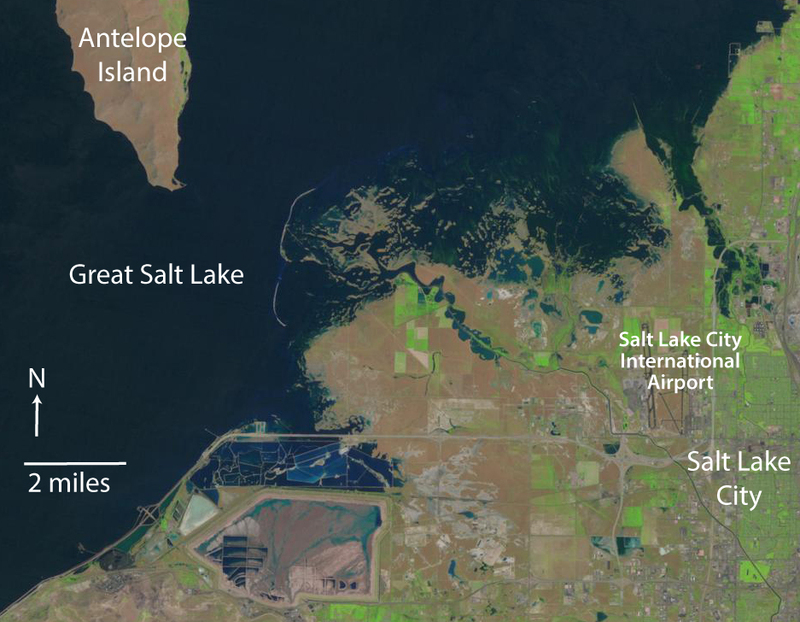 Great Salt Lake level changes, that in part contributed to the multiple migrating river channels and deltas, continue in response to climate cycles, water usage, and evaporation rate. The historical average lake elevation is about 4200 feet. In the late 1860s to early 1870s and again in 1986–87, Great Salt Lake rose to 4212 feet (1284 m). Mapping of this historically high level shows the potential for repeat damaging flooding adjacent to the lake and shallow groundwater rise in low-lying areas. The Granger fault of the West Valley fault zone is truncated by the incised paleo-Jordan River channel. A 2010 UGS paleoseismic investigation of the West Valley fault zone across two strands of the Granger fault documented four large (surface-faulting) earthquakes since the highstand of Lake Bonneville (~18,000 years ago) and the most recent earthquake occurred about 5500 years ago (see UGS Special Study 149, G in mosaic image). The paleo-Jordan River has since eroded and removed evidence of the earthquake fault scarp within its river bed. Near the east end of the incised paleo-Jordan River channel, two organic-rich samples were collected from a consultant’s 1997 paleoseismic trench on the Taylorsville fault of the West Valley fault zone near Interstate 215 (H in mosaic image) that yielded an average age of 2200 years for the timing of a surface-faulting earthquake (see Survey Notes v. 30, no. 3, 1998). My working hypothesis is that the 2200-year earthquake may have disrupted flow of the west flowing paleo-Jordan River, dropping the eastern margin of the river down to the east and potentially causing the Jordan River to shift and flow north instead of west (E in mosaic image). The abandonment of the paleo-Jordan River channel may have also been influenced by earthquakes on the Warm Springs fault by tectonically lowering its base level. Understanding the response of the Jordan River to earthquakes in the past will help us plan for future earthquakes, possible river migration, and other impacts from tectonic subsidence. 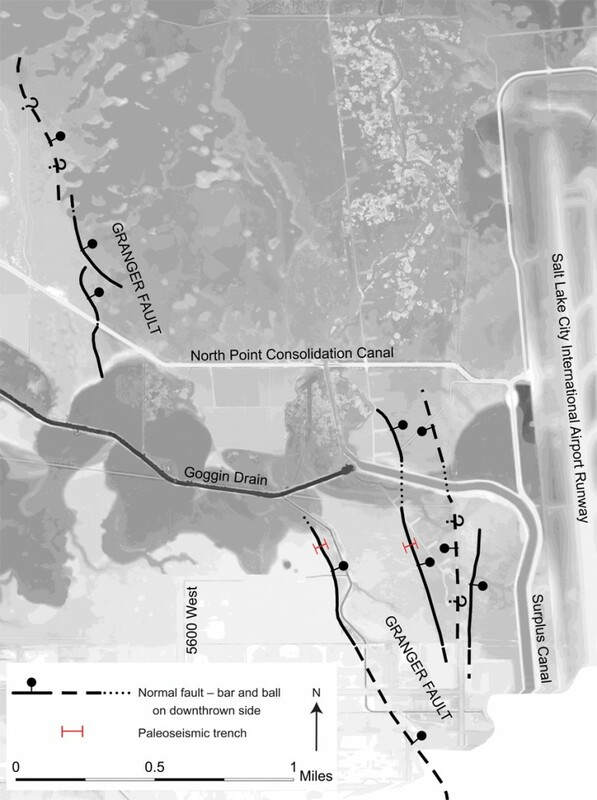 A UGS paleoseismic investigation from the same area is in progress and will hopefully provide additional insight into the history of the Jordan River, Great Salt Lake, and their response to previous earthquakes (see this Survey Notes). Of particular importance to this project is the location of the Warm Springs fault through downtown Salt Lake City. Much of the evidence of the fault has been destroyed by development and aggregate mining activity along Beck Street. As a result, little is known about the Warm Springs fault and its location has long been debated. For this mapping, data on the location of the fault came from a number of sources: a cooperative project between the UGS and Salt Lake County to archive their collection of geotechnical and related investigation reports; available information from the consultant community; research at the University of Utah; and interpretation of multiple aerial imagery and topographic datasets, including new 0.5 meter LiDAR data. This data and an evidence-based approach to mapping of the Warm Springs fault led to increased understanding and confidence in the fault’s location. Knowing the fault location with greater certainty can help reduce surface fault rupture damage to buildings, critical infrastructure, and reduce lives lost through proper planning. The fault is currently the subject of a detailed geophysical investigation by researchers at Boise State University. Upon the completion of their investigation and the incorporation of their findings, the Salt Lake City North quadrangle geologic map will be finalized for publication. During mapping in the City of North Salt Lake and Salt Lake City, I observed multiple landslides (Springhill, Parkway Drive, and City Creek landslides) that occurred in a weak tuffaceous bedrock unit (see Survey Notes v. 47, no. 1, 2015). This unit has significant future landslide potential as development continues. 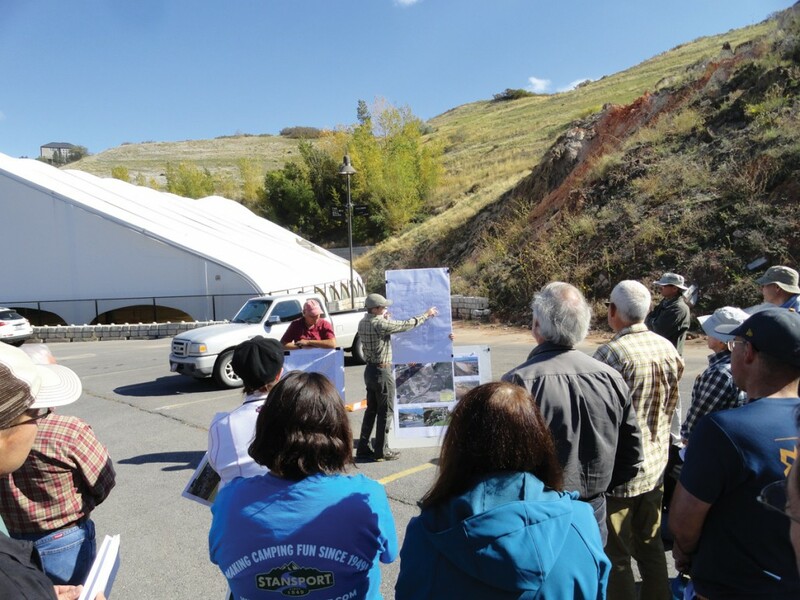 During a UGS-hosted field review of the area, we discussed the unit’s landslide hazard potential with local government agencies, geotechnical consultants, and interested geologists in attendance. In addition to the landslides, I mapped known rockfalls in City Creek Canyon, which will help identify potential for additional rockfalls in the future. 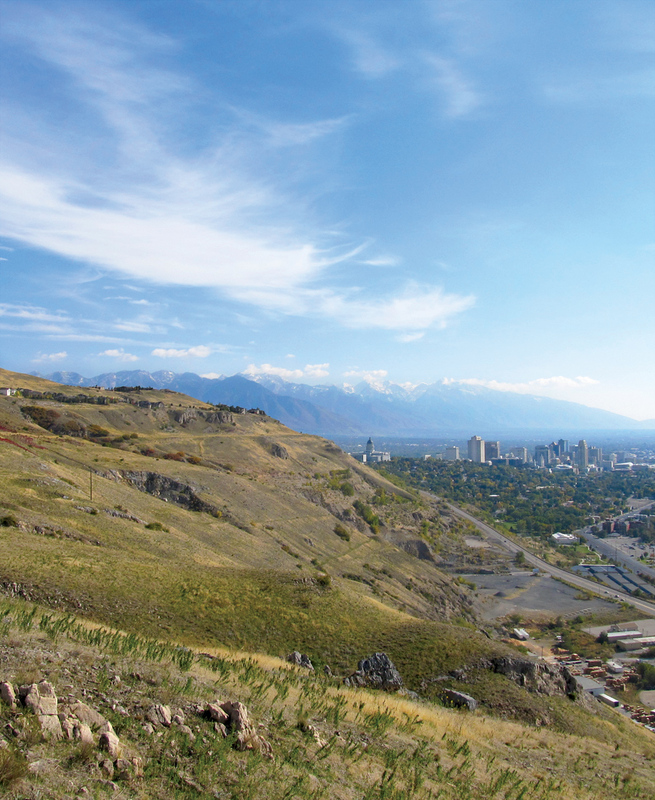 These maps provide new and revised geologic mapping of existing urban areas in northern Salt Lake Valley and areas planned for significant development. The maps identify, delineate, and describe major geologic issues affecting development, including high Great Salt Lake water levels, the location of the Wasatch and West Valley fault zones, geologic units with liquefaction potential, problem soils, rockfalls, and landslides. The maps provide descriptions of surficial soil and rock units that can be used to identify problem geologic units. They also identify and delineate faults and landslides that may cross urban areas, where major industry, infrastructure, and residential areas exist. The geologic maps will be used in subsequent creation of geologic-hazard maps that show the location and relative severity of various geologic hazards. Geologic map publications, invited talks and meetings, and field reviews are all methods the UGS uses to share valuable information learned from these investigations with local and state agencies, researchers, consultants, and other interested parties. We hope that objective geologic information provided by the UGS will lead to hazard awareness and a reduction of geologic-hazard-related costs to society through informed and proactive development and risk minimization. Glad You Asked: What is Geovandalism?